In the world of beer, right now is one of the most exciting and wonderful times of the year. It comes but once a year and can turn grown men (and women) into excited little children. What is this wonderful and rare time that many beer lovers dream about for 11 1/2 months out of the year? Wet hop beer season! This year’s first major hop harvests happened within the last month and a half and in the time since, many breweries have taken the opportunity to use those extremely fresh “wet” hops in their beers for a truly fresh and unique experience. Let’s start with a brief breakdown of the role that hops play in the brewing picture so we can understand why this time of the year is so unique and excellent. The purpose of these beautiful little herbs is to provide bitterness to beer to balance out the intense sweetness imparted by the malted grains. Hops are also useful in that they act as a preservative and antibacterial agent in the beer helping it remain drinkable for long periods of time. Hops have been used in beer in Germany for nearly 1000 years, in England for under 500 years and in the United States for less 400 years. Prior to the use of hops various herbal mixtures, some labeled “gruit” or “grut”, were used to balance out the malt’s sweetness. I’ll talk more about grut in the future. For now let’s stick with hops. Fast forward from the advent of hop use in brewing centuries ago to hops’ current place in the beer world and you will find that hops have become nothing short of a sacred herbaceous bine. It is called a bine rather than a vine due to the botanical categorization that hops fall under. *Interesting to note is that the hops’ nearest botanical relative is cannibis (marijuana), and it is also worth noting that the lupulin from hops has a mildly sedative effect not too dissimilar to the effects of cannabis. * All modern breweries now use hops exclusively as the bittering agent in essentially all beer produced on the planet. The thing about basically all of those hops is that they are rarely used in their fresh “wet” form. 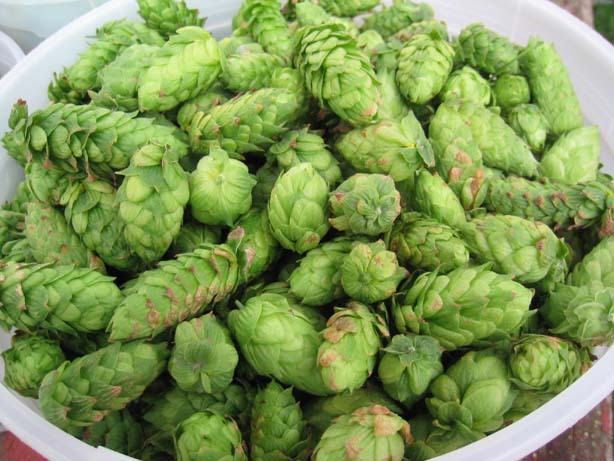 Hops are usually dried or concentrated through compacted pellets or through the use of hop extract to use in large quantities in breweries. The flavors and aromas from hops can range from bright fresh grapefruit or citrus, to exotic aromatic tropical fruit, to heavy dank resinous pine sap, to earthy and musky, to light crispy spiciness. They can either take center stage in a beer (like in an IPA) or remain totally in the flavor and aroma background (as in a Belgian Dubbel or Quadrupel). But you can only get the subtle and super fresh tastes and aromas from hops once a year when you harvest them directly from the bine and without letting them dry out, add them to the beer either during the boil or during fermentation. Mouthfeel: Crisp and fairly light body, present bitterness throughout but bitterness clings to the tongue on the end aided by the dry finish. Overall: Excellent fresh hop beer, which really showcased the different flavor and aroma profiles that hops can impart on a beer. There were citrus, earthy, floral, and spicy aspects to both the aroma and taste which maintained balance and were not overly bitter. I really loved the hop bud in the growler as a finishing touch as it was not only cool to see, but smelled and tasted fantastic. 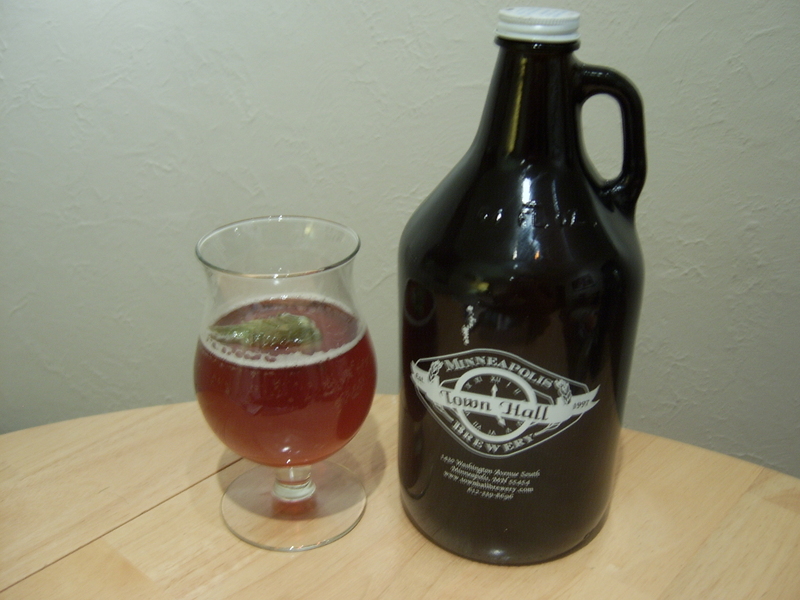 A dry hopped growler, how about that! Mouthfeel: Moderate carbonation, mild body that is lightly sweet, finishes a bit dry with a lingering bitterness that sits on the back of the tongue. Overall: A subtle and palatable fresh hop beer. Not overly bitter, and a pleasant hop aroma and taste balanced by sweet caramelly malt. I could have a couple of these with no problem. A well done more subdued example of a fresh hop beer. A good one for someone looking to be introduced to a fresh hops without getting knocked off your feet. Taste: Strong lemon and grapefruit taste right away, leading to some pine and resinous flavors, a backing of light toast from the malt, and finishing with a nice floral flavor as if tasting fresh flowers. Mouthfeel: Light carbonation, fairly light body, quite crisp and refreshing, lightly bitter at the end, but very pleasant. Overall: A very well done wet hop beer! Great hop aromas of bright sunshiney citrus with some resinous qualities and even some perfumey aromas all very well balanced by a subdued malt presence. Very easy drinking and thoroughly enjoyable. As if the beer isn’t tasty enough, it is both certified Oregon Tilth Organic and the barley and hops are grown on Sierra Nevada’s estate in Chico, California. This beer just makes you feel good and it’s classy with the wax seal. Aroma: Fresh grapefruit giving way to a bready maltiness, very fresh aromas of grassy/fresh plants and lightly spicy at the end. Taste: Citrus and grapefruit on the front and then a light sweet breadiness to balance it out and a sprightly bitter white grape aftertaste. Mouthfeel: Lightly effervescent, with a light body, doesn’t linger in the mouth very long, just leaves a slight pleasant bitterness. Overall: A beautiful light colored and bodied wet hop beer. 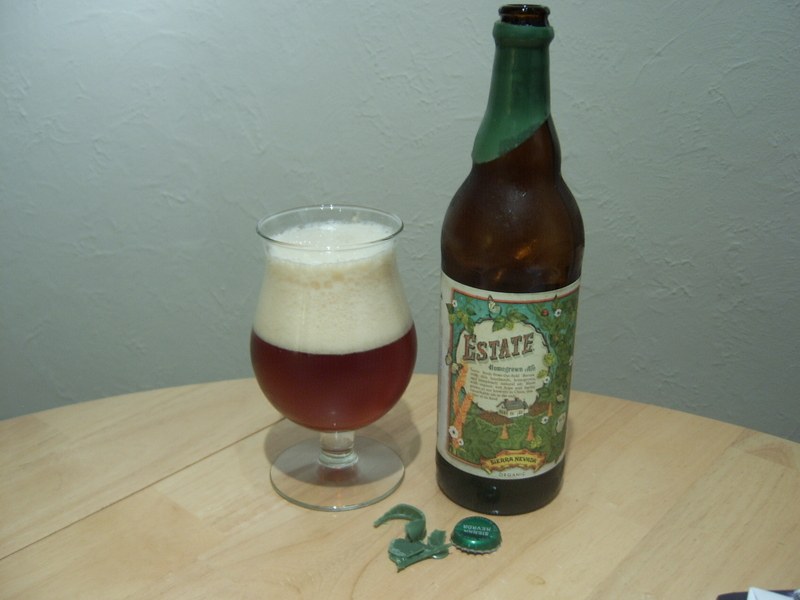 Very fresh and aromatic with a clean grapefruit/citrus dominant flavor and a very grassy earthiness in the aroma. The lighter malt contributes some nice subtle breadiness which works very well alongside the light and fresh hops. Appearance: Bright copper/orange, clear with a coarse white head that doesn’t stick around long. Aroma: Light ripe banana at the beginning, sweet caramel, some mellow earthiness on the end. Mouthfeel: Lightly carbonated, smooth and medium body, subtle bitterness on the finish. Overall: I was surprised by the banana aromas and flavors but they were pleasant. Good hop/malt balance. 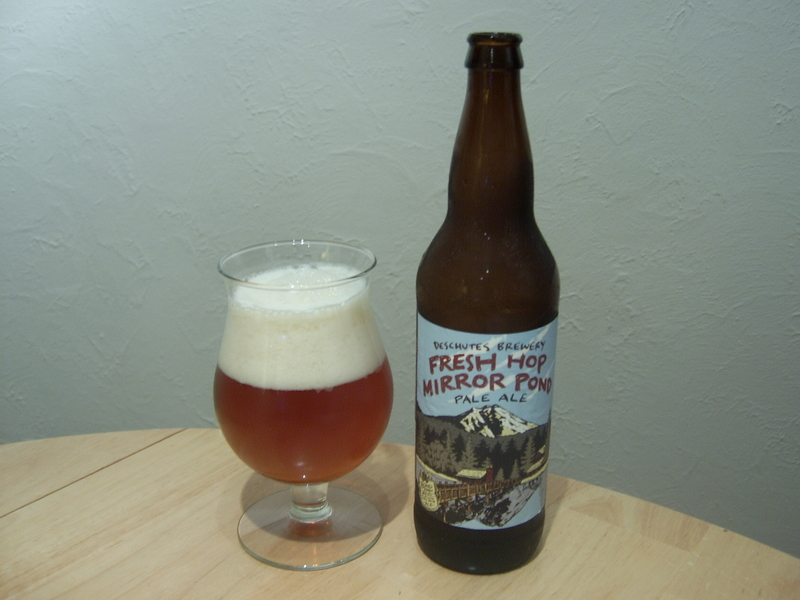 Fun take on their classic Mirror Pond Pale Ale recipe. Taste: Orange/grapefruit and some light pine up front, sugary caramel and finishing with a slightly dank earthy bitterness. Overall: Super refreshing, sprightly, juicy and tangy. A wonderful wet hop beer that is thoroughly drinkable and makes me smile after each swallow. This release is a hot commodity from Surly and unlike their other releases that you can find for months afterwards and still enjoy, Wet must be drunk as soon as possible after purchase to get the true experience, making it all the more exclusive. Overall: A fresh hop bomb! Very present ripe fruit and resinous hop bitterness but with a strong enough toasted malt backdrop to stand up to. Definitely the biggest and most robust of the group. Also, the freshest due to the close proximity of the hops to the brew house. So after repeated drenchings in fresh hoppy goodness, my tongue felt it most enjoyed the Surly Wet. To anyone who has tasted this beer, it is likely no surprise. I just couldn’t help but relishing in the crisp juicy citrus aromas and flavors and the light delicate balance it maintained. The 100 Yard Dash was definitely in close contention on the other end of the spectrum as a super hoppy example of a fresh hop with Founders and Sierra Nevada also being near the top. Really it was just a joy to sit down to each of these beers because they are all created in honor of the hop. They pay homage to the rarity of this moment when the hops can be enjoyed in their purest and freshest form. So I would highly recommend picking up any fresh hop beer that you can find on store shelves in the next week or two because once they are gone, they’re gone until next October. Do not sit around with a fresh hop beer in your fridge, do not cellar them, because these beers are an impulsive delight and they are best when enjoyed ASAP. This post has been a treat and I’ve been so focused on enjoying it that I haven’t come up with my post for next week yet. I have a few ideas rolling around in my head, but let me know if you have any suggestions for next week’s post or for any other future ones. So until next Thursday, grab a fresh hop beer, kick back and enjoy the waning days of warmth as we move into the cold season here in Minnesota, where we must find and create our own warmth (luckily there are plenty of beers that can do just that). 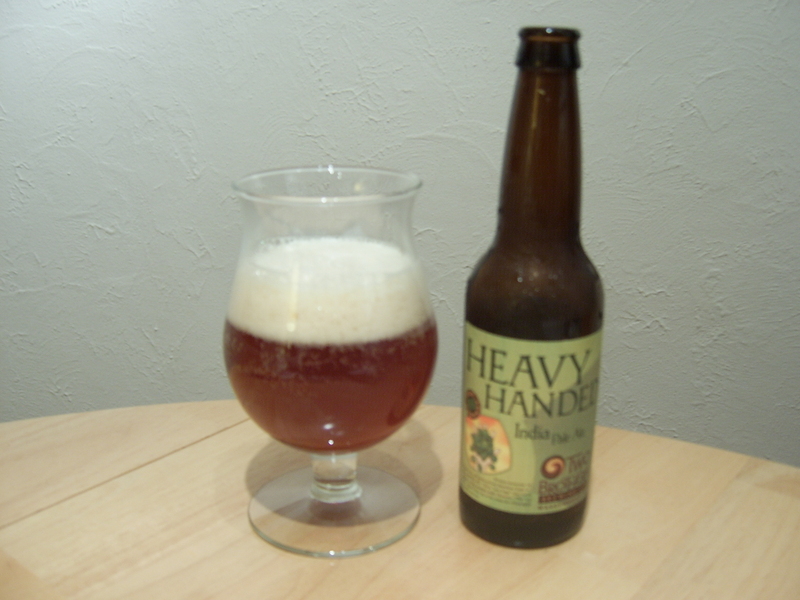 Posted in Uncategorized and tagged beer, beer review, brau brothers, craft beer, deschutes, founders, fresh hop, hops, sierra nevada, surly, town hall, two brothers, wet hop. Bookmark the permalink. Your reviews are informative and enticing; makes me want to try a few of these “nouveau” concoctions!